Coccidiosis is a disease caused by internal parasites called Eimeria. These live inside the cells that line the birds intestine. As they reproduce, they cause bleeding and swelling in the intestines. Coxoid is a medication that vets will sometimes suggest to control coccidiosis. Birds lose a lot of liquid and cannot absorb nutrients from their food and will soon die if left untreated. In the absence of licensed alternatives, veterinarians sometimes prescribe drugs such as this under the ‘cascade’ to treat coccidiosis in poultry. It is only a veterinarian who can advise on such use and we would be in breach of the veterinary medicines regulations and NOAH code of practice by supporting, or encouraging the use of a product on a non-target species. Coxoid is marketed under the Small Animal Exemption Scheme which covers small domestic pets, including birds, however it is not intended for use with animals producing food. So for chickens producing eggs, it’s only your vet who can advise you to use it in this way, in the absence of other suitable licensed products. 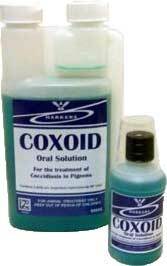 Coxoid comes as a liquid that is administered diluted with drinking water. Coxoid contains 3.84% of the drug amprolium hydrochloride which is a structural analogue of thiamine (vitamin B1). Amprolium hydrochloride mimicks it’s structure, inhibiting thiamine utilisation by the parasite. You can buy Coxoid here but remember to seek the advice of your vet first! The dilution rate of Coxoid to fresh drinking water is 1fl.oz per gallon (6.22ml per litre or 28ml per 4.5 litres). It is normally available in 2 sizes: 112ml and 500ml. It should be given for 7 days. An improvement can be expected within 2 days. Do not allow birds to have access to unmedicated water during treatment. Coxoid should not be used on birds that are intended for human consumption.